I seem to be all about the tacos and tostadas lately. There are at least 2 bags of tortillas, several limes, some cilantro and a wedge of cotija cheese in my fridge at all times. I guess I like to be prepared for any taco emergency at a moments notice. And why not? 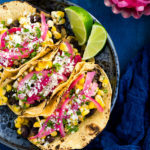 Tacos are the perfect quick meal – the fillings are extremely versatile and, in most cases, can be put together with ingredients you can easily keep on hand. Let’s take these cuban-style black bean and elote tacos for example. The basis for the filling are some canned black beans and some corn. Although I like to use fresh corn, you can substitute in frozen corn kernels just as easily. Then throw in some flavor builders like onions, chili powder, and apple cider vinegar and you can have dinner done in no time. Honestly, the black beans and the elote are good enough to stand on their own as two winning side dishes. However, when you put them together and add some pickled red onions and charred tortillas, it’s a downright flavor explosion. Kind of like how these photos are an explosion of color that is way outside my usual aesthetic. What do you think? Too much? Let’s taco ’bout it. In a small saucepan, stir together the apple cider vinegar, water, sugar, and salt until the sugar is mostly dissolved. Add the onions to the vinegar mixture. Bring the onions to a boil then reduce heat and simmer for 8-10 minutes. Toss the onions around occasionally as they simmer so they cook evenly in the pickling liquid. Set aside. Place the ears of corn on microwave-safe plate and cover with wax paper. Cook the corn in the microwave for 6-8 minutes, turning the cobs every 2 minutes until the corn is just cooked. Let cool. When the corn is cool enough to handle, cut the corn kernels off the cobs (see Notes). Discard the cobs and place the kernels in a medium bowl. Add mayonnaise, cilantro, lime juice, chili powder, and a pinch of salt. Stir until evenly mixed. Adjust salt to taste. Set aside. In a large skillet, heat the olive oil over medium-high heat. Add the onions, garlic, oregano, and chili powder. Cook until the onions are softened, stirring occasionally, 3 to 5 minutes. Add the black beans, vegetable broth, and apple cider vinegar. Mash about 1/4 of the black beans with a fork or back of a spatula. Simmer the mixture over medium heat until slightly thickened and most of the liquid is gone, 5-6 minutes. Warm the tortillas in the microwave or char them on an open flame. Top each tortilla with some black beans, corn, pickled onions, and cotija cheese. Sprinkle additional cilantro and lime juice on top, if desired. You can also grill the corn if you prefer a smokier flavor. To cut the kernels off the cob, use one hand to stand the cob up on a rimmed baking sheet, with your other hand run a sharp knife down the cob cutting through the kernels as you go.